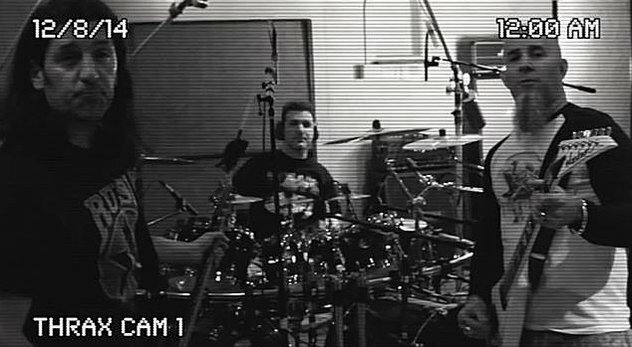 ANTHRAX have joined forces with producer Jay Ruston once again and have entered the studio to record the follow up to their 2011 Grammy nominated and critically acclaimed album, ‘Worship Music’. Charlie Benante, Frank Bello, Joey Belladonna, Scott Ian and Jon Donais have been writing and demoing new tracks over the past few months and plan to record well into January of next year. The as yet untitled album, the band’s eleventh full studio offering, is set for a 2015 release. The band recently released their new Live-DVD ‘Chile On Hell’, filmed at the Teatro Caupolican in Santiago. The concert was recorded in 5.1 surround sound and is available on DVD and Blu-ray + 2 Live CDs.